Did you know that there are 210 different goat breeds, and out of all those breeds, there are several miniature breeds? Here, we are going to discuss the 7 most common miniature goats from around the world and focus on what makes them different from each other. 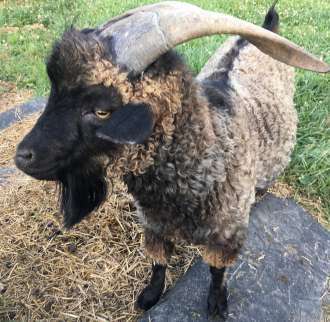 Although all these mini breeds have one thing in common, they’re smaller than your average sized goats, they’re also unique in their own way. So, what are the smallest goat breeds? When discussing goats that stay small, the Nigerian Dwarf is one of the most common breeds and one of the most expensive ones too. Why are they so expensive? The Nigerian Goat is a miniature dairy breed that can produce up to 1 to 3 quarts of fresh milk each day. 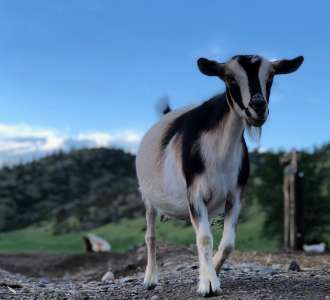 Not all goats are classified as dairy breeds, and the ones that are usually cost quite a lot more than non-dairy breeds. The milk produced by the Nigerian Goat is a little different from most of the milk produced by other goats. A Nigerian Goat’s milk has a higher protein content and a sweeter taste too. This is a result of the higher percentage of butterfat that’s in the milk. The best part? Consumers will pay top dollar for this flavorful milk. The shape of the Nigerian Goat’s body is also another attractive feature to dairy farmers. Their neck and legs are longer and skinnier than other breeds. This makes milking the Nigerian Goat a much easier job. Dairy farmers also love the Nigerian Goat due to its ability to breed all year long. When you consider the milking and breeding abilities of the Nigerian Goat, this breed is definitely worth the investment. It’s important to note that this breed requires a lot of space. They definitely don’t do well in confined areas. The Nigerian goat survives best in open areas with special accommodations like tree stumps and large rocks to play on. They love to climb and explore their areas. 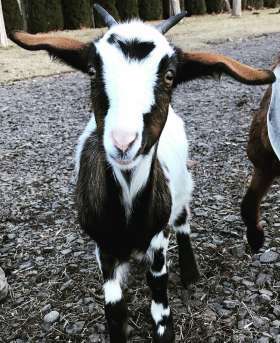 The Pygmy Goat is quite similar to the Nigerian Goat, but this breed is also unique in its own way too. This breed is a little bigger in size than the Nigerian Goat. In fact, they’ll usually grow to a size of 16 to 23 inches. That’s about the average size of a medium sized dog. Pygmy Goats don’t have an array of color combinations like the Nigerian Goat, but never-the-less, they’re still a beautiful breed. 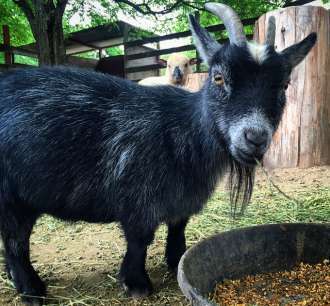 The main difference between Pygmy Goats and Nigerian Goats is that the Pygmy goat isn’t considered a dairy breed, because their tiny teats making milking the goat an extremely tough job. Although you can milk the Pygmy Goat, it’s very inefficient and not really worth your time. However, they’re commonly raised as a meat source for farmers and other consumers. In fact, the Pygmy Goat is the smallest meat breed out of all the breeds. The real unique feature about the Pygmy Goat is their playfulness. This breed makes great pets and is the perfect addition to your farm. Although the males can be a little standoffish, they tend to get along with just about all other farm animals including dogs, cats, sheep, and cattle. If you’re interested in breeding the Pygmy Goat, you’ll be happy to know that they can produce anywhere from one to four children every 12 months. You can either raise the goats yourself or sell them for a nice sized profit. When it comes to the smallest goat breeds, the Pygmy Goat is a very special animal with a lot of great qualities. Out of all the fiber breeds, the Pygora is the smallest. Their meat is said to be tender and very tasty. In addition to this, the Pygora Bred can also produce up to about a quart of milk every single day. Like the Nigerian Goat, the milk from the Pygora breed is sweet and high in protein. Although it’s not as sweet as the Nigerian Goat’s milk, it still has a very flavorful taste. Another feature that makes this breed a popular investment is their hand spinning fiber qualities. This fiber is soft, durable, and can be sold for a nice sized profit. It’s also great for making clothes, stocking hats, blankets, and other sewed goods. For anyone who’s looking for a great pet that’ll help around the house, the Pygora Goat is the perfect choice. Not only is the Pygora breed friendly and great with children, they also love to eat grass, weeds, flowers, bushes, and other plant life. This is great for anyone trying to clear a field get rid of those pesky weeds. By simply investing in three or four Pygora Goats in a grassy field, you’ll see it get cleared quite quickly. 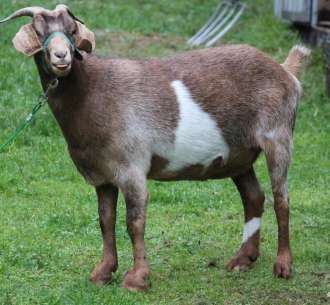 The Mini Nubian breed is a dairy goat that produces milk with the highest butterfat content out of all the dairy goats. In addition to this, their milk is homogenized and a great choice for lactose intolerant individuals. Mini Nubian goats can usually deliver up to two quarts a day for their owners. From milk to butter to sour cream and cheese, this breed is a great choice for dairy loves. Like many of the smallest goat breeds listed here, the Mini Nubian also makes a great pet and is a very friendly animal. Many owners say they resemble puppies, are very vocal, and will even respond to their name when called. Mini Nubians love to simply be around humans. The best part about the Mini Nubian Bred is that they come such a wide array of colors. In addition to this, these beautiful goats also have cute floppy ears and brown, button eyes to go with it. They’re truly an adorable breed. The Nigora Goat has two main purposes, milk and fiber production. Their milk is said to be very flavorful, and their fiber has a very soft texture to it as well. 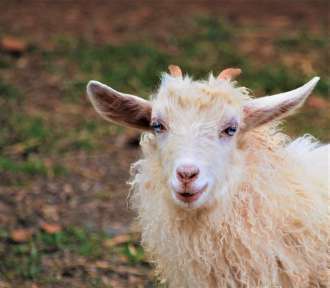 This goat breed is a cross between the Nigerian Goat and the White Angora. The Nigora Goat is a medium to larger-sized mini breed and usually grows anywhere from 19 to 29 inches in length. They are also known for their other physical characteristics like their rectangular shaped physique, their well-defined jaw, and their bushy coat. Both the males and the females may have horns, and both genders come in a wide array of color combinations too. Like most of the breeds listed here, the Nigora also make wonderful pets as well. They appreciate their owners, and they tend to be very affectionate as well. However, the males can be a little stubborn at times, but for the most part, this breed is definitely a good animal to have around. The Kinder Goat is a result of breeding Pygmy and Nubian goats. This breed wasn’t created until the 1980s and as a result, they’re a fairy rare breed. The Kinder Goat is mainly raised as a dairy breed due to its high butterfat content. Their milk is usually used to make butter and cheese, and the Kinder Goat can usually produce a greater yield than most other dairy breeds. Because the Kinder goat can grow to a full size of 26 inches and 140 pounds, this breed is also raised for their meat. In fact, a female Kinder Goat can breed all year round and have up to eight children every 12 months. A farmer with a nice sized herd is able to produce quite a lot of meat each year in addition to milk and cheese as well. The Kinder Goat is definitely a wise choice for farmers interested in making a profit. This is one beautiful goat miniature goat breed. The physical characteristics of this breed include hair that’s both long and silky, numerous color combinations, and a gorgeous, lustrous coat. Males tend to grow to an average height of 23.5 inches and females typically grow to an average height of 22.5 inches. 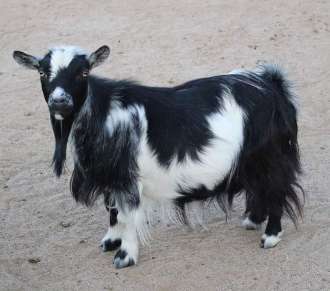 Originally, the Miniature Silky Fainting Goat came to be when farmers bred the Tennessee Fainting goat and the long-haired Nigerian goat in the early 1990s. Most Miniature Silky Fainting Goats carry the gene for a condition called myotonia, a muscle condition that causes the goat to experience stiff muscles and even fall to the ground when they experience feelings of excitement or happiness. Although the Miniature Silky Fainting Goat is not typically bred for meat or dairy production, they are definitely helpful when it comes to eating weeds and other unwanted vegetation. In fact, a herd of these goats can clear quite a large area in no time. So, what is the smallest goat breed? The smallest goat breed is the Nigerian Dwarf, but when choosing the right breed for your needs, you’ll want to consider what your use for the goats are. Consider if you’re interested in dairy product, meat production, fiber production, a vegetation eater, or simply a friendly pet. Once you know what it is you want to get out of your miniature goats, then you can choose the right breed for you.